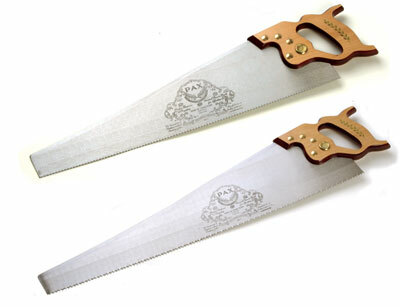 Not only do Thomas Flinn's Pax saws have a history going back to 1776 but the company is bang up to date with their detailed website, which covers most saws that a craftsman could want, even two-man crosscutting saws. The saws on test here are a 26in 4 1/2tpi ripsaw and a 22in 10tpi panelsaw. Both are taper-ground and breasted so that only a few teeth are in contact with the timber, making for easier sawing. I was unaware that such beasts were still made, so it was a pleasant surprise to find a brand-new one to test. My workshop's small-capacity machines cannot saw through thick boards so ripping down the grain is a bit of a challenge, especially when a large lump of timber is involved... not anymore though. This one sailed through 75mm-thick elm with the minimum of effort and was a real pleasure to use. The panel saw was equally impressive. I cramped a board of 18mm blockboard to my Workmate, scribed a line across and proceeded to cut... and the saw made very short work of it. As I said last month I wasn't keen on the rather harsh beech handles, but in the tradition of many craftsmen you could easily make or adapt a handle that you are comfortable with. 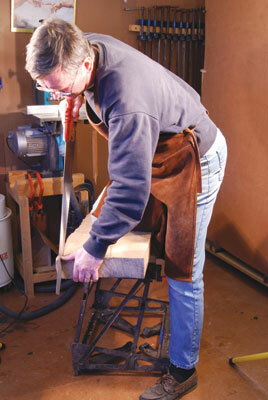 These are fine saws, the ripsaw especially being very useful in a small workshop. They are Sheffield made so have the tradition of British toolmaking behind them and are user re-sharpenable - a long-term asset in any toolkit.